First, I measured the length I'd need for the number of cars I wanted to store. I figured that the length would be 26 inches by 16 1/2 inches. I then used the hanger as a guide to shape the top. I then marked the location of where the pockets and words would be. I traced the words I printed out onto freezer paper, and cut them out with my pocket knife. I ironed on the stencils, and then painted the lettering. Then, I made the pockets. Each pocket was made from two pieces of fabric 2 1/2 inch by 16 1/2 inches long, sewn right sides together and turned, and then attached to the background where I'd marked. I sewed the pockets by topstitching the bottom and basting the sides. I marked the pocket dividers with tailor's chalk, and sewed down each pocket. I made a skinny piping, and basted it to the outer edge of the garage. For the applique, I drew a car shape based on the fabric and made appliques with aqua and white fabric and heat n bond. I ironed on the 3 pieces, then added layers of freezer paper stencils in black, white, and peach to add the details. For the back, I cut two pieces of fabric that together made up the back, but overlapped. I basted them together before I sewed the back and front together. I then sewed the front and back pieces together, and then opened up the basting stitch, and turned everything right side out. Lastly, I ironed everything, and inserted the hanger into the garage. Thank you so much to those who voted, and wish me luck as I begin this adventure. 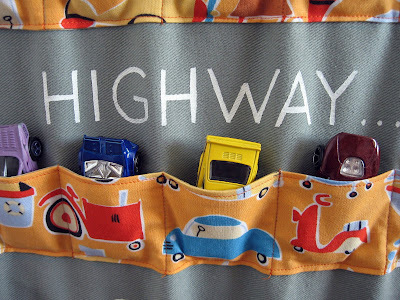 UPDATE: Kim @ Girl and a Glue Gun came up with a fun alternative way to make a car hanger. See HERE. Linking up with The Girl Creative, Keeping it Simple, Sumo's Sweet Stuff, and Making the World Cuter, Delicious Ambiguity and Today's Creative Blog, and The Nifty Nest. Shared on Someday Craft's All About Boys and Kojo Designs Gifts for Guys. Featured on Oopsey Daisy, and Somewhat Simple, and The Baby Center Blog. 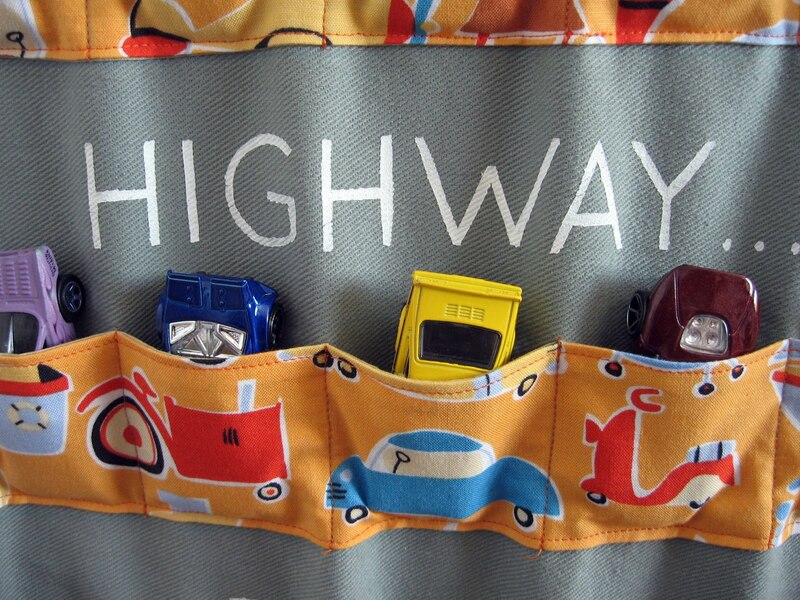 I love this matchbox car organizer!!! I saw your entry on SYTYC, and voted for it. My son has tons of match box cars and not enough space to store them all. I have seen the plastic versions of these, but they do nothing for me. I plan on making him one of these very soon!! Thanks for sharing your tutorial on how to make these. This is great!! I love it and it seems like you always have room on your doors and not on shelves. Thanks for the great idea! My goodnes I LOVE this! I need to add this to my long to do! So creative - Thanks for the tutorial! Thanks for sharing, this is such a great idea. I love it!i have to do for my little one! Me encantó!La tengo que hacer para mi hijo pequeño!! pd:sorry for my english i know is bad!! pd:perdon por mi ingles, se que es muy malo!! 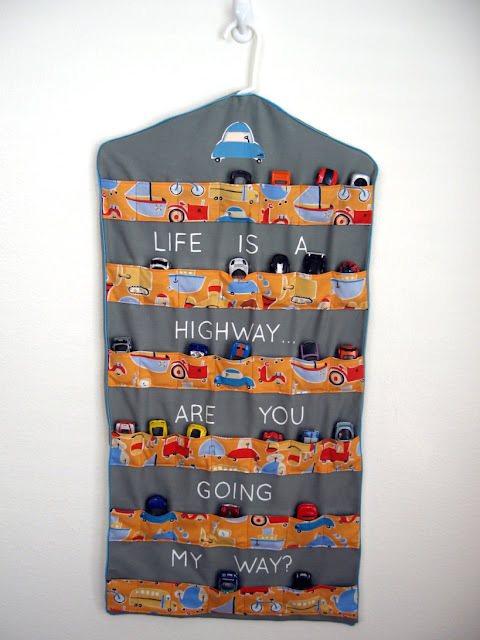 This is sheer genius, and I love the "Life is a highway". My son would love this! Thanks for sharing! Saw this on Oppsey Daisy today and I LOVE, LOVE, LOVE it. I don't have any boys to make one for, but I might just have to make one for a gift. This is amazing!! Oh this is AWESOME! I'm adding this to the "queue" to make for my granddaughter because she loves playing with cars! love love love this!! you are one talented lady!!! Thanks for a great idea, I have been recently been wondering what I can do with all my son's cars. I am making one today. Thanks for sharing. Such a cute idea! I have to remember (aka pin) this idea for my nephew's birthday! I found you from being featured on Prudent Baby's 25 more gifts for little dudes. I cannot sew. Would love to purchase one of these...are you selling them? @BeckaHi Becka! I might consider making you a matchbox organizer...but it would have to wait until we're done with our house. Would late July or August be a good time frame for you?